There is nothing like a good old-fashion road trip to break up your routine and I just got back from a fantastic one. 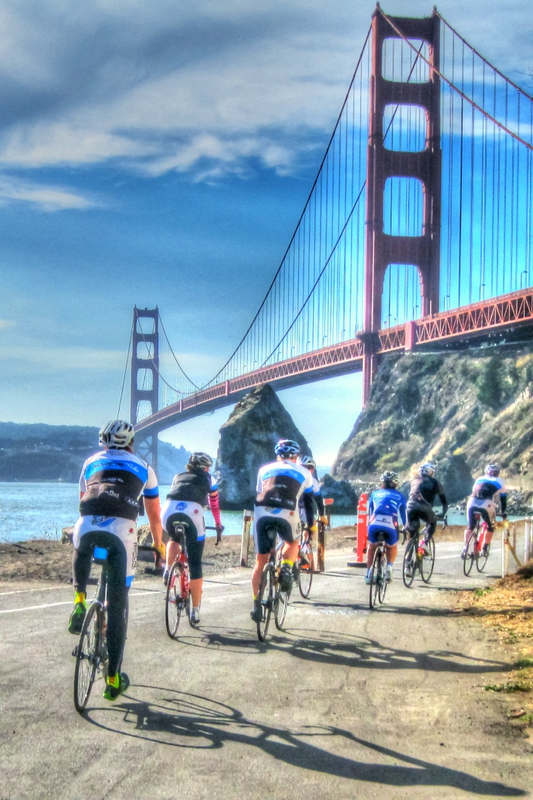 The plan called for Tim, Brian and I to drive and cycle our way down the coast from Sonoma County to San Diego where the trip would culminate with us riding the Gran Fondo San Diego. This trip has the word “epic” written all over it and it did not disappoint. After months of planning, we were ready to debark. With bags and bikes packed, Tim and I rolled from my house around 5:30 pm. After a quick trip to Sonoma to get Brian we are southward bound and full of that special excitement and energy that you can only get from hanging with the boys. As we rolled towards the Golden Gate Bridge we were already imagining the adventures that awaited us. The only slight issue that dampened our spirits was the heavy rain. After a quick dinner in San Francisco at Rubio’s, we kept heading south. About an hour later our road trip enthusiasm started to fade. Our goal was to reach Solvang, which would be a 6-hour drive. What in the hell made a bunch of 40+ year old guys think we could work all day and then drive 6-hours in the pouring rain like a bunch of college frat boys? We finally reach Solvang just after 1:00 am and we were totally wiped out. Thursday morning we were pleasantly surprised to discover there wasn’t a cloud in the sky. So after breakfast we hit the road. Our destination? Mt Figueroa. This ride will get its own blog post so for now let me just say it was epic. Nearly 50 miles and 5000 feet of climbing. After the ride, we ate lunch in Solvang and then hit the road again. Our destination this time was Woodland Hills where we would rest up for our climb up Mt Wilson on Friday. However, as we made the 3 hour drive, Brian checked the weather and discovered that Mt Palomar, Saturday’s destination, had predictions of rain, snow and high wind. Well, we were all more interested in climbing Mt Palomar then Mt Wilson so we changed our plans. Friday morning had us back in the car on the way to Mt Palomar. We arrived around noon and got ready for another epic climb. I have to say however we were still a little flogged from Mt Figueroa and numerous hours in the car. After another adjustment, we decided to simply climb Mt Palomar as an up and back route. Once again, this ride will get its own story but I will say it was basically a 13 mile climb with 4400 feet of climbing followed by a matching descent. On Saturday, we finally arrived in San Diego. After checking into the hotel, we went out for a short, easy recovery ride that was awesome. From the downtown harbor, we rode out to the end of Pt Loma and back. On this day we were playing the role of cyclo-tourist. We pedaled lightly and rode with our heads up soaking in the views of San Diego and the Pacific Ocean. On the way back, we stopped to check in for the Gran Fondo. We then grabbed lunch (at a brew pub of course) and settled in to relax. As we did the storm promised by the weather people began to arrive. Soon it was raining sideways. However, it was supposed to be gone by morning and Sunday was going to be scattered showers. That’s not the way it turned out. Sunday morning was still pouring. After waiting at the start for almost an hour, I was already squeezing water out of my gloves. Knowing we still had an 8 hour drive ahead of us, we finally decided that riding for 4 hours in the pouring rain wasn’t going to be fun so we turned in our timing chips and headed for home. Now, you may think the trip was a disappointment since we didn’t ride the Gran Fondo. Nothing could be further from the truth. Although we were a little bummed to miss that ride, it did not take way from a great trip. We may try it again next year. Who knows, maybe the weather will be more cooperative. In the meantime, we will keep riding together in Sonoma County and share stories about our awesome road trip to San Diego. Never been to San Diego, but all I keep hearing is how it’s a wonderful vacation spot, especially for spring break! Are the hotels nice? Sideways rain is never fun. I used to think that was limited to the Midwest. Looks like you got in some great rides regardless!